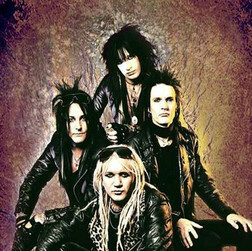 GEMINI FIVE´s strong material and heavy-catchy- songs combined with their energy and flamboyant- in-your-face-attitude makes them undefeatable. They create a sound never known to the world and their performance is ultra-heavy-cool-rock&roll. GEMINI FIVE was the package all four was looking for. During the summer of 2001 GEMINI FIVE began rehearsals for some club dates later that fall. A 7-track demo was recorded and the band started looking for a record deal. The word was out and quite soon record label WILD KINGDOM offered the band a deal. GEMINI FIVE entered the studio with producer LEO in december 2002 and began recordings of 12 songs. Their debut 'Babylon Rockets' was released all over Europe, Japan and South America in October 2003. Their first single 'You spin me round (like a record)' listed no.19 in the swedish single charts May/June 2003. GEMINI FIVE released their long awaited second album, titled "Black:Anthem", Sept. 2nd 2005, and have achieved a more intense and modern sound, still not lacking of memorable choruses and earth shattering riffs. "Black:Anthem" contains 13 tracks and the video for the 1st single "When The Body Speaks", was directed by brilliant filmmaker Charlie Granberg. The album reached No. 8 on the Swedish charts. USA, released "Babylon Rockets", through Cleopatra Records in the summer of 2005, and their latest effort "Black:Anthem" was released on June 6th 2006 (666). Also, a second video/single, the title track "Black:Anthem", was released on October 20th, 2006.